Asking just $7.50 for BOTH -- MUST SELL -- Make me an Offer !! Buyer to pay U.S. Shipping, or items can be picked up. Cash or Money Order only. Two Gifts-in-One -- Give one for Easter & save the other for Christmas !! Two (2) Fun-Filled, Chunky, Cartoon Coloring Books - Christmas & Easter -- Each Paper Back Book is filled with Pages & Pages to Color, & measures approx. 8 x 10-3/4 inches. - My Great Big Christmas Fun Book - Coloring, Activities, Games, Puzzles, Mazes, Search & Find, & More ! - Dated 1994, Paperback, 287 pgs. 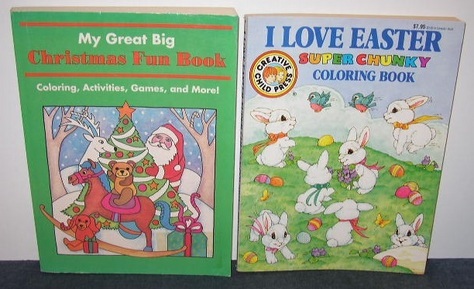 - Creative Child Press - I Love Easter - Super Chunky Coloring Book - Dated 1987, Paperback, 192 pgs of Coloring Fun & the Story of Sam the Bunny !